5335 Damocles (/ˈdæməkliːz/ DAM-ə-kleez) provisional designation 1991 DA, is a centaur and the namesake of the damocloids, a group of minor planets which are inactive nuclei of the Halley-type and long-period comets. It was discovered on 18 February 1991, by Australian astronomer Robert McNaught at Siding Spring Observatory in Australia. It is named after Damocles, a figure of Greek mythology. When Damocles was discovered, it was found to be on an orbit completely different from all others known. Damocles's orbit reached from inside the aphelion of Mars to as far as Uranus. It seemed to be in transition from a near-circular outer Solar System orbit to an eccentric orbit taking it to the inner Solar System. Duncan Steel, Gerhard Hahn, Mark Bailey, and David Asher carried out projections of its long-term dynamical evolution, and found a good probability that it will become an Earth-crosser asteroid, and may spend a quarter of its life in such an orbit. Damocles has a stable orbit for tens of thousands of years before and after the present, because its highly inclined orbit does not take it near Jupiter or Saturn. There is some speculation that Damocles may have a meteor shower associated with it on Mars from the direction of Draco. The object has a Mars minimum orbit intersection distance (Mars–MOID) of 0.057 AU (8,500,000 km; 5,300,000 mi) and a Uranus–MOID of 0.3 AU (45,000,000 km; 28,000,000 mi). As of 2019[update], Damocles is 19.6 AU from the Sun with an apparent magnitude of 26.3. It reached its furthest point from the Sun in 2011. The adjectival form is Damoclean, /dæməˈkliːən/. The official naming citation was published by the Minor Planet Center on 1 September 1993 (M.P.C. 22508). ^ a b Schmadel, Lutz D. (2007). "(5335) Damocles". 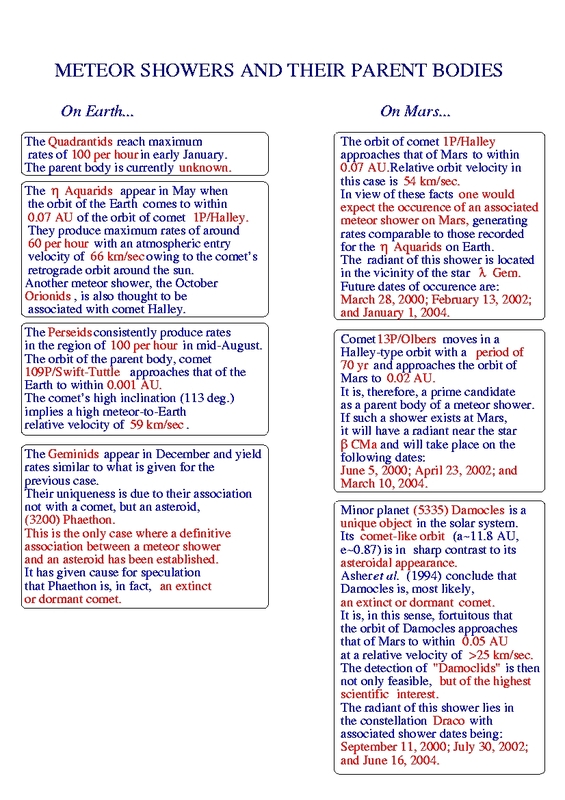 Dictionary of Minor Planet Names – (5335) Damocles. Springer Berlin Heidelberg. p. 457. doi:10.1007/978-3-540-29925-7_5143. ISBN 978-3-540-00238-3. ^ a b c "5335 Damocles (1991 DA)". Minor Planet Center. Retrieved 14 February 2017. ^ a b c "JPL Small-Body Database Browser: 5335 Damocles (1991 DA)" (1992-08-22 last obs.). Jet Propulsion Laboratory. Retrieved 21 September 2017. ^ a b c "AstDyS Damocles Ephemerides". Department of Mathematics, University of Pisa, Italy. Retrieved 21 September 2017. ^ Asher, David J.; Bailey; Hahn; Steel (1994). "Asteroid 5335 Damocles and its implications for cometary dynamics". Monthly Notices of the Royal Astronomical Society. 267: 26. Bibcode:1994MNRAS.267...26A. doi:10.1093/mnras/267.1.26. ^ Asher, David; Bailey, Mark; Hahn, Gerhard; Steel, Duncan (27 May 1993). "Asteroid 5335 Damocles and its implications for cometary dynamics". Monthly Notices of the Royal Astronomical Society. 267: 26–42. doi:10.1093/mnras/267.1.26. Archived from the original on 17 July 2016. Retrieved 17 July 2016. ^ "Meteor Showers and Their Parent Bodies". Archived from the original on 2008-10-03. Retrieved 2006-12-30. ^ "MPC/MPO/MPS Archive". Minor Planet Center. Retrieved 14 February 2017.